ADAPTIVE INNOVATION · Portfolio: Control the Size of Your Bet Innovate inside the box INNOVATE INSIDE THE BOX? How horrible and boring does that sound? Surprisingly, the concept comes from Disney, one of the most cre- ative organizations in the world. When Michael Eisner took over Disney, the company was losing money. One of his first mandates was to assign a strict financial box to each Dis- ney project. 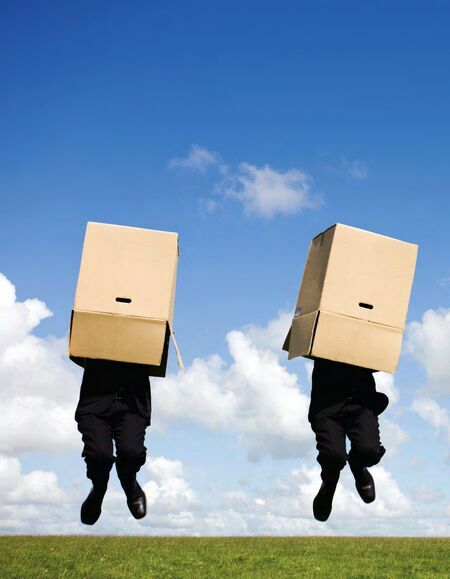 Employees were then challenged to creatively fit their ideas inside the financial box. Unfamiliar with such intense control, the creative people at Disney were skeptical (if not angry). 216 In the opening scene for the 1987 movie Outrageous Fortune, Shelly Long's character, Lauren, was supposed to visit her parents in their upscale New York City apartment to beg for money. The script involved just one scene with the parents, but it would require an additional set and actors to play the parents. Small details like this drive up the budget. To fit "inside the box," Eisner forced the writers to find a less expensive alternative. The result was that Lauren never enters an apartment at all. She buzzes her parents' intercom, but her mother won't open the door. She doesn't want to lend Lauren more money. Lauren pleads, and sneakily, the father drops an envelope from the second-story window. No set was required, and the scene was actually more effective. 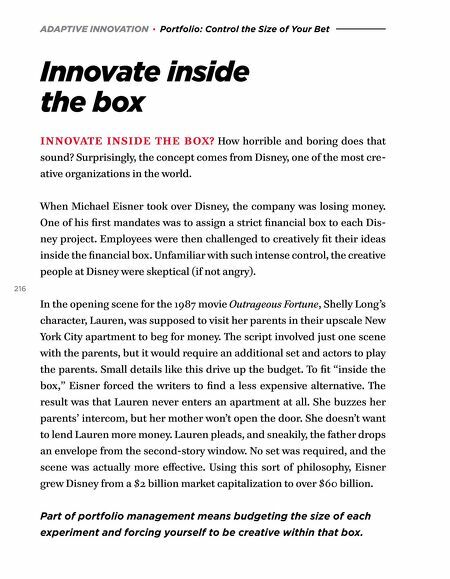 Using this sort of philosophy, Eisner grew Disney from a $2 billion market capitalization to over $60 billion. Part of portfolio management means budgeting the size of each experiment and forcing yourself to be creative within that box.